As Red-carpet dressing becomes over-diluted, unique and less relevant, Billy Porter, the black and gay breakout star of the boundary-expanding FX series “Pose,” was seen to be dressed up as the most rebellious star. Billy wore a tuxedo-gown that made him stand head and shoulders above the others. The name of the famous fashion designer ‘Christian Siriano’ is well used to dressing celebrities for high-profile events. He caters to a clientele that includes such Popular personalities as Lady Gaga, Taylor Swift and Victoria Beckham and Rihanna. 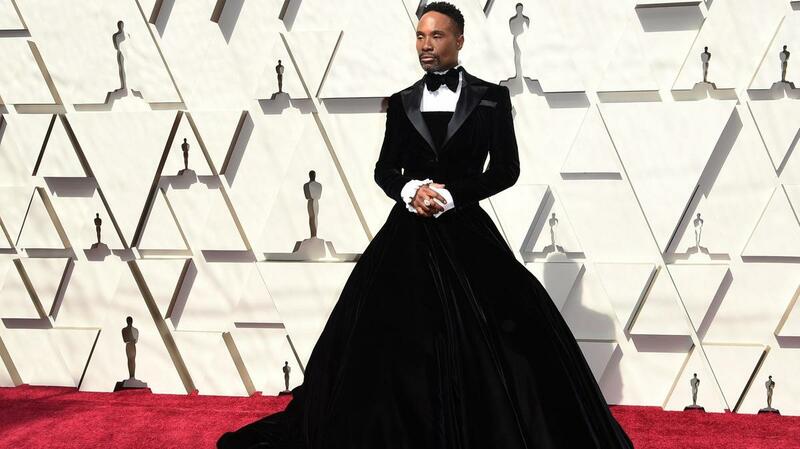 However, at Oscars 2019, he created just possibly the most talked about Oscar look where he dressed actor Billy Porter in a full-length velvet tuxedo-gown. The hybrid – an utterly melding of a beautifully cut man’s tuxedo and a woman’s gown – broke the glass boundary of what constitutes dressing up and what clothes can be worn and by whom. What Billy has to say about his look ? Well, Billy’s Comment was disproven afterwards, as there was mega-praise for his velvet custom tuxedo look by Christian Siriano and outrage over the notion that an African American man in a dress was a threat to black masculinity. the gender divide and racial boundaries. The Black actor and Singer, on a phone interview, elaborated: “We have to teach people how to treat us, we have to teach people how to love us, we have to teach people how to respect us, and the only way we do that is to respect ourselves.” I see fashion as a ‘political art’, he added. Well, Porter’s custom-made look was no accident, but was the outcome of many hours of conversation between actor and designer. Every element of the outfit had been talked through. What’s the most fascinating thing about the dress is that the fabric chosen was black velvet, a material that absorbs all the light and masks all the details, leaving just a silhouette, of silken lapels and bow tie, which is unmistakably masculine. The Outfit was gloriously dramatic and truly statement-making.